Emiliano Raul Sala Taffarel, professionally known as Emiliano Sala was an Argentine professional football player. He played as a forward. He was playing for the French club, Nantes before signing to Cardiff City for a club record fee of 15 million Pounds in January 2019. He was flying from Nantes to Cardiff aboard a Piper Malibu light aircraft on 21 January. His plane disappeared in the English Channel. The aircraft crashed off Alderney on 21 January 2019. His body was discovered on 4 February inside the wreckage and recovered on 7 February. In his honor, Nantes retired his former jersey number 9. He scored a total of 95 career goal from 2009 to January 2019. His ability to hold the ball up, work-rate, tenacity, eye for goal, finishing ability, and pace. BBC Sport compared Sala to Jamie Vardy of Leicester City. Who is Emiliano Sala Secret Lover before death? Emiliano Sala was born on 31 October 1990. His birth name was Emiliano Raul Sala Taffarel. He was born to Mercedes Taffarel and Horacio Sala. His birthplace was in Cululu, Santa Fe in Argentina. He held Argentine nationality. His zodiac sign was Scorpio. He had two siblings, a brother, Dario, and a sister, Romina. While growing up, he was a die-hard fan of Independiente. Sala began playing football for San Martin de Progreso. He played there until he was 15 years old. He then joined school Proyecto Crecer at San Francisco, Cordoba. He played for Spanish club CD Soledad B from October 2007 to February 2008. He then joined Portugues club, FC Crato in 2009. He played only one official match for Crato and returned back to Argentina. He said that his girlfriend was in trouble back in his homeland. Sala moved to Europe to play for Bordeaux during the 2010-11 season. However, he was allocated the club's youth team and later reserve team throughout the season. He made debut for club's senior team in the 2011-12 Coupe de France round of 16 fixture against Olympique Lyonnais. He came as a substitute in the 105th minute. Failing to earn a place in the club's senior team, he moved to Championnat National club, US Orleans on loan. He scored 19 goals in 37 appearances and helped the club to an eighth-place finish in the Championnat National. Sala then joined Ligue 2 club, Chamois Niortais on loan for the 2013-14 season in July 2013. He scored 20 goals for Chamois Niortais in all competitions, his 18 league goals set a new club record for goals in a single season. Following his impressive performance, he was called up to the Bordeaux's first team ahead of the 2014-15 season. He was loaned to Ligue 1 club, SM Caen for the second half of the 2014-15 season. He joined Ligue 1 club, Nantes on a five-year contract for a reported transfer fee of 1 million Euro in July 2015. Starting his first season at Nantes, he went on to become club's top goalscorer for three consecutive seasons. He became the first FC Nantes player to score three goals in a Ligue 1 match in October 2018 since Mamadou Diallo in February 2006. He was voted Ligue 1 Player of the Month for the month of October 2018. During the mid-season transfer, he joined Premier League club, Cardiff City on a three and a half-year deal on 19 January 2019 for a club record transfer fee, reported to be 15 million pounds. Sala went to Cardiff to complete his medical. He returned to Nantes on the morning of 19 January on a plane arranged by football agent Mark McKay. It was a Piper Malibu aircraft flown by the pilot, David Ibbotson. He returned to Nantes to bid farewell to his Nantes teammates and collect personal belongings. On 21 January, the same plane flying him from Nantes to Cardiff disappeared off Alderney. Two days later, Channel Islands Air Search reported that there was no hope of finding any survivors in the water. Argentine media outlet Ole released an audio message, allegedly sent from the plane by Sala to his friends via WhatsApp, which quotes, "Hello, my brothers, how are you? Boy, I’m tired. I was here in Nantes taking care of things, things, things, things, things, things, and it never stops, it never stops, it never stops. Anyway guys, I’m up in this plane that feels like it's falling to pieces, and I’m going to Cardiff. [It's] crazy, we start tomorrow. Training in the afternoon, guys, in my new team... Let's see what happens. So, how's it going with you guys, all good? If in an hour and a half you have no news from me, I don't know if they are going to send someone to look for me because they cannot find me, but you will know... Man, I'm scared!". The Guernsey Police announced that they had called off the search for the aircraft or any survivors after initial three days search over 1,700 square miles across the English Channel and thorough and extensive search by three planes, five helicopters, and two lifeboats. The world, along with Lionel Messi, Gonzalo Higuain, Sergio Aguero, and Diego Maradona called for the search to continue. Mauricio Macri, the president of Argentina stated his intention to request the British and French governments to resume the search. 65,000 signatures were collected in an online petition to continue the search. Sala's family decided to fund a private search. A sports agency that represented Sala, Sports Cover, collected over 280,000 pounds via GoFundMe. The funds enabled the private search to commence on 26 January with the launch of two boats, led by marine scientist David Mearns. On 30 January, the Air Accidents Investigation Branch (AAIB) reported that they had found two seat cushion washed up on a French beach. The washed-up seat cushions were believed to be from the missing aircraft. AAIB's Geo Ocean III vessel and a privately-funded vessel conducted sonar surveys of the seabed lasting three days covering an area of 4 square nautical miles, about 24 nautical miles north of Guernsey starting from 3 February. The wreckage of the aircraft was found at approximately 21:11 GMT at a depth of 63 meters. Investigator stated that there was one body visible inside the wreckage on 4 February. Sala's body was recovered from the wreckage on 7 February. The body was taken to the Isle of Portland to be passed to the Dorset coroner. Dorset Police identified the body as Sala's on the same day. 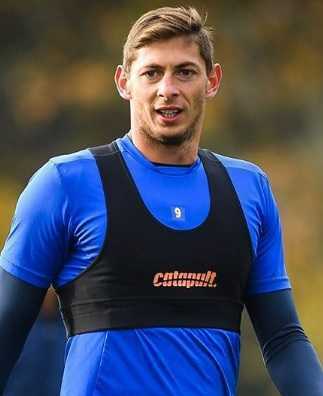 Emiliano Sala stood at a height of 1.87 m i.e. 6 feet and 2 inches tall. He had an athletic body build. He had a body weight of 75 kg. He had gray eyes and light brown hair. His net worth of Emiliano Sala was estimated at around $5 million. He was transferred from French club, Nantes to English club, Cardiff City in a club record transfer fee reported at 15 million pounds. While growing up, he used to study footage of his favorite footballer, Gabriel Batistuta. He scored his first career hat-trick against Stade Lavallois in 2014. 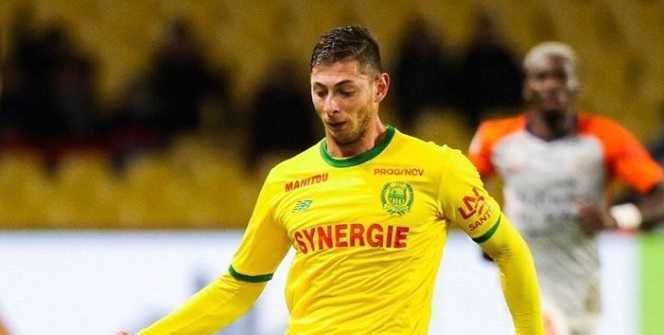 His then-club Nantes rejected 3 million pounds bid for Sala from Wolverhampton Wanderers in January 2016. Turkish club, Galatasaray tried to sign him ahead of 2018-19 season. Sala rejected a bid from Chinese Super League club to play in the Premier League. Nantes retired Sala's former jersey number 9. Cardiff City included Sala on the team sheet for their game against Arsenal on 29 January. A daffodil next to his name was made in place of a squad number.